The Bible says, "Don't run after something to eat, something to wear and something to drink", but it is not too much to say that actions of the past chairmen of the CCK are for money and power. They did things to be blamed morally in the world more actively, using the name of God. The pastor Gil Ja-yeon, the 9th, 10th and 17th chairman of the CCK, is considered as the most controversial chairman, who is the person directly involved in controversy over the plutocracy of the CCK, ‘10-dang-5-rak’. The pastor Kang Joo-seong of the General Assembly of Presbyterian Church in Korea (HapDong) held a press conference on the plutocracy of the pastor Gil and exposed “the pastor Hong Jae-chul, who stand by the pastor Gil side, distributed 1 million won to each of the 40 pastors.” and many pastors blew the whistle one after another. Even in the 2010 election for the vice-chairman of the General Assembly of Presbyterian Church in Korea (HapDong), the pastor Gil caused controversy over the plutocracy. It is known that he reserved a hotel room for the chairmen who support him and handed out envelopes containing 200,000, 300,000, 500,000 won and even 1 million won for special order. The pastor Choi, who is the most close aide to the pastor Gil, admitted that he handed out envelopes and confessed that “it usually costs about 2 billion won to win an election” Back in 2011, SBS's ‘indepth 21’ aired the plutocracy election of the 17th chairman of the CCK under the title ‘Truth of 10-dang-5-rak’ and it caused a big stir. As a result, voices to disband the CCK began to appear, forming ‘A christian network for disbanding the CCK’, etc. In addition, in 2011, he was suspected of breach of trust and special appointment at the Calvin University and he intensified controversy to become the president of the Chongshin University illegally on his own, even though a 70-year-old retired person can not become the head of a religious organization. The pastor Hong Jae-chul, who served as a close aide to the pastor Gil and became the 18th and 19th chairman, left behind suspicion of not only the succession of the church but also the credential embellishment. He revealed that he received a bachelor's degree and graduated from Graduate School of Theology of the Chongshin University and studied a master's course at Yonsei University's United Theology Graduate School, but it turned out to be false. In addition, the doctorate in theology, Th.D. degree at University of Washington, was confirmed not to be able to be received by the pastor Hong, who has never studied abroad. And in the end, the pastor Hong was found to be imposed hands at a unqualified theological school. 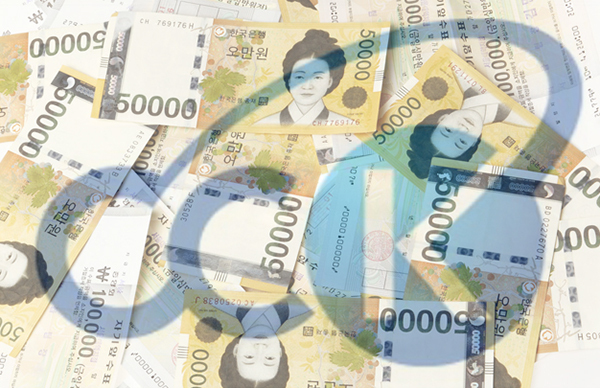 The pastor Hong was also the person directly involved in distributing money envelopes in person according to instructions of the pastor Gil when the pastor Gil ja-yeon was elected as the 17th chairman of the CCK, represented by ‘10-dang-5-rak’. 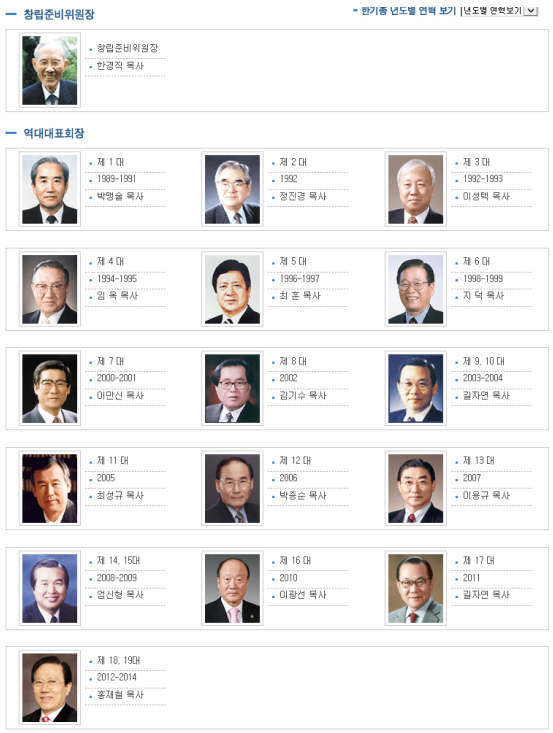 In addition, the 11st chairman Choi Sung-kyu, the 12nd chairman Park Jong-soon, the 14th and 15th chairman Um Sin-hyung and the 16th chairman Lee Kwang-sun were also embroiled in controversy over the plutocracy. Frankly speaking, after the plutocracy debate, the 16th pastor Lee Kwang-sun confessed in a press conference that "The CCK's reality is that nobody can become a chairman without distributing money." The reason why the CCK, which never has a peaceful day, went into the path of self-destruction is the controversy over the recruitment‧release of a cult. Conclusively, the division has begun in earnest when the pastor Hong Jae-chul, the 18th chairman, accepted The General Assembly of The Reformed Presbyterian Church in Korea as a member, which recruited the 'Big church' (The pastor Byun Seung-woo) called 'The attic' and released the attic from cult in 2012. At the 99th general assembly in September 2014, the General Assembly of Presbyterian Church in Korea (HapDong), key members of the CCK, withdrew from the CCK due to this incident, saying 'The CCK and the pastor Hong Jae-chul, who recruited the cult, are cults', and there was a rush to leave the CCK one after the other. And religious bodies who withdrew from the CCK gathered together to form The Communion of Churches in Korea (CCIK). As this incident started to touch off, the pastor Hong earned a disgrace of being expelled from the CCK for the first time as chairman, but later he won in the social law and thus expulsion became invalid. After the separation of the CCIK, the CCK and CCIK have continued to argue acrimoniously that 'each other is a cult'. And there were rumors to be involved in heresy because the pastor Lee Yong-gyu of the Seong-nam holiness church, who served as the 13rd chairman of the CCK, also had a close relationship with the pastor Byun Seung-woo of the Big church (the attic) and attended a revival meeting. The pastor Lee Young-hoon, who is a moderator of the session of Yoido Full Gospel Church and the 20th, 21st and 22nd chairman of the CCK, was named as a cult. It is because that in January 2017 The Korean Committee for the Protection of the Right Faith (Basuwi) of the CCIK unveiled a plan to ‘Research into heresy‧cult groups that prevent the union of Korean churches’ and referred to the pastor Lee Young-hoon, who is a moderator of the session of Yoido Full Gospel Church, and senior pastor Cho Yong-ki as heretics. ◆ What about the chairman of Shincheonji church whom the Korean Church criticizes in one voice? has won numerous Peace and Volunteer Prizes. It is the Shincheonji Church of Jesus the Temple of the Tabernacle of the Testimony (Shincheonji Church of Jesus) that the religious world of Korea, including the much-troubled CCK, and the Christian media are all together opposing, calling it as heresy‧cult. Why does the Shincheonji church receive such criticism as heresy‧cult from troubled Korean churches? In fact, the chairman of Shincheonji church has been sued by numerous people. We compiled the results of prosecution investigation along with the details of each complaint. Just 10 years ago, in May 2007 MBC's PD Notebook aired a broadcast under the provocative title "Suspicious Secret of the Shincheonji church", suggesting that the Shincheonji Church of Jesus is a cult to encourage running away from home. The aftermath of the broadcast was devastating. The first scene, in which some 45,000 members of an unfamiliar religious group moved in perfect order, made the religious world nervous. Reports that they encourage running away from home and taking a leave of absence in young people and commit assault and embezzlement of public money were enough to give the viewers the impression that they are an anti-social group. After the news, the Shincheonji Church of Jesus became a hot topic, as it ranked number one in Naver's search list. After the report of the PD Notebook, Lee Man-hee, the chairman of Shincheonji church, has been investigated extensively by prosecutors for encouraging running away from home, taking leave of absence, assaulting and breach of trust‧embezzlement. According to an official of the Shincheonji Church of Jesus, the investigation was very strict, as there was a lot of social interest at the time. However, the Suwon District Prosecutors' Office concluded in December 2007 that ‘all were innocent.’ Based on this, MBC's PD Notebook published correction and counterargument reports in 2009. In particular, the fact that the leader of a large religious body, who led tens of thousands of people, was acquitted by a massive investigation into breach of trust and embezzlement provides evidence that the finance and accounting of the Shincheonji Church of Jesus are very transparent. However, the report on the correction and counterargument was forgotten and even now the program of PD Notebook has been suggested as the basis for slandering the Shincheonji Church of Jesus, just like a textbook. 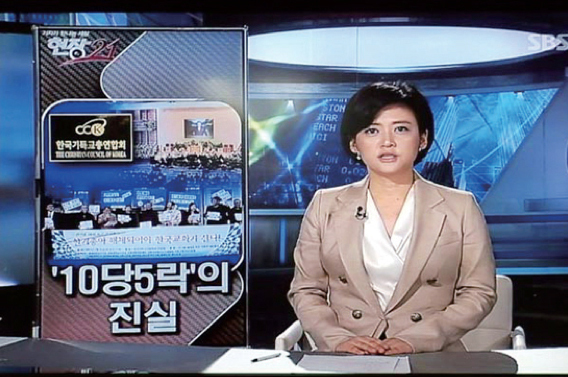 Though the investigation on encouragement of running away from home was already acquitted after the PD Notebook, in 2014, the Chairman Lee was sued again for ‘Child abduction for profit.’ However, the court made it clear that some young people runaways in the Shincheonji church were not due to the Shincheonji church but to the coercive conversion program and found the Shincheonji church not guilty. 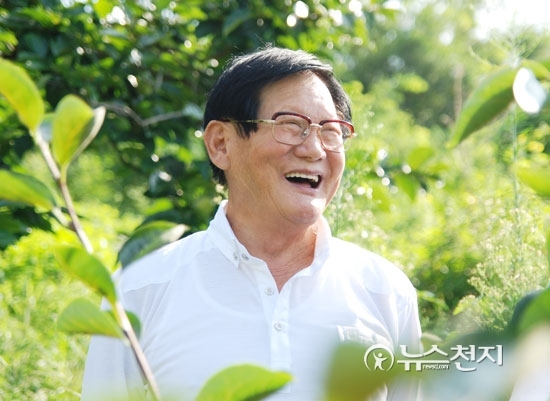 The Chairman Lee was also accused of ‘Teaching the Bible for free.’ The plaintiffs argued that it was a violation of the law on private institutes that the Shincheonji church has been teaching the Bible for free and they filed a lawsuit in 2007, 2008 and 2015. The Christian media often compares the Shincheonji church with ‘baegbaeg-gyo (白白敎)’ and ‘yeongsaeng-gyo (永生敎)’ in the past, criticizing them as heresy·cult. However, unlike ‘baegbaeg-gyo’ and ‘yeongsaeng-gyo’, which committed crimes against humanity, the fact is that no criminal charges have been confirmed in the chairman of the Shincheonji church. Scholars are continuing to criticize the behavior in which heresy·cult regulatory rules are unilaterally stipulated and notified from the so-called orthodox denomination in Korea. Lee Jong-geun, former dean of the Sahmyook school of theology, pointed out at the 10th Christian Media Forum that when a expert on heresy denounces a certain person or group as a cult in a distorted short-sighted way and propagandizes it through media outlets, broadcasting and publishing, the individual or group is subject to serious personal oppression, defamation and civil‧criminal damage. The 18th, 19th pastor Hong Jae-chul (2012~2014) causing the division of the CCK after releasing the attic from cult. Since then the pastor Hong was considered a cult and was expelled form the CCK, but he won in the social law of the world and was restored only as a member.